Hang Son Doong Cavern has been classified as the world's largest known cave. Animals within this mammoth underground structure can be divided into two categories: those who reside in the forested expanses where the cave roof has collapsed, and those who dwell in the darkness of the enclosed cave passages. Son Doong Cavern's name translates to “mountain river cave.” This name is appropriate because a river runs through the length of the cavern. Son Doong is part of Phong Nha-Ke Bang National Park, which is near Vietnam's border with Laos. It belongs to a network of about 150 caves in the Annamite Mountains, many of which have never been explored. A 200-foot-tall wall of muddy calcite within the cavern, called the Great Wall of Vietnam, prevented the cave's full exploration for many years. In its largest area, the cave is 800 feet high and 300 feet wide. It even has its own clouds at the ceiling. Hang Son Doong, a limestone cave, was formed 2 million to 5 million years ago when river water flowing across the rock found a fault and carved out a giant tunnel beneath the Annamite mountain chain. Where the cave ceiling has collapsed, life has flourished within Son Doong's massive expanse. The cavern's exposed passages are filled with many of the same plants and animals that inhabit the surrounding jungle. 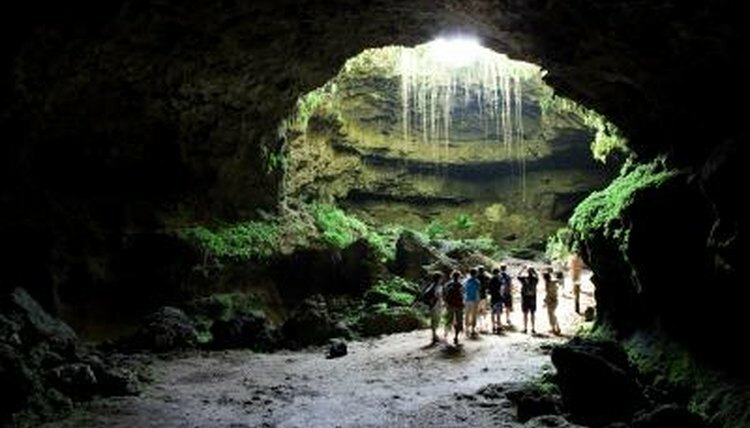 Birds, monkeys and snakes have been spotted by explorers in the cave. Since the cave has been explored by only a few teams throughout the decades, little documentation exists on the species found within it. In its closed-off sections, Son Doong Cave's darkness is impressively thick. The unlit portions of the caverns are home to albino species that have adapted to life without light. In this environment, animals have no need for pigment, and many have no or diminished sight, since total lack of light makes eyes useless. Anette Becher, a German caver and biologist, is one of the only scientists to have observed animals within the inky-black passages. During her expedition she identified wood lice, fish and millipedes inside the darkest crevices of the cave. Son Doong Cavern is contained within Phong Nha-Ke Bang National Park. Within the park, more than 500 vertebrate species have been identified, as well as hundreds more invertebrates. Although they have not yet been officially documented as this cave's residents, many of the national park's inhabitants make their homes in the cave's open areas. Phong Nha-Ke Bang is known for having the largest population of langur monkeys in the world. Several species of bat, which are very likely candidates to inhabit Son Doong, call Nha-Ke Bang home. Many rare birds, including the chestnut-necklaced partridge (Arborophila charltonii) and the short-tailed scimitar babbler (Jabouilleia danjoui), are found here. Many of the 250 butterfly species found within the park are most certain to drift through the exposed passages within Son Doong Cavern. A number of new species have been found within the park, including the little-known gecko Gekko scientiadventura, Orlov's treefrog (Rhacophorus orlovi) and the striped hare (Nesolagus timminsii), recently discovered within the Ammanite Mountains. What Animals Are at Mount Rushmore? What Kind of Animals Live on Mt. Etna? Where on Earth Do Spiders Not Live? How Does Deforestation Affect Panda Bears? What Kind of Animals Live in Mammoth Cave?